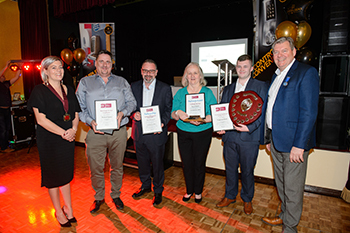 Industry professionals and promising newcomers in the door hardware industry have been recognised at the annual Institute of Architectural Ironmongers awards ceremony. The IAI Fellowship Award was given to Mario Del-Signore, director of CES UK and the current treasurer of the GAI. The Paul Lewis Award for Customer Service went to Karen Nelson, business development manager at Hoppe (UK) and chair of the IAI Midlands branch, after being nominated by one of her customers for her technical and product support. The GAI Award for Services to the Institute went to Michael Spoors, managing director of Norseal, who recently stepped down as branch chair of the IAI South East branch. He is also a member of the Education Committee and the CPD working party. The Promising Ironmonger of the Year award went to Cameron Parry, sales advisor at Locks & Fittings Ltd. He completed the third year of the GAI Diploma at just 18, and is now working towards his RegAI status. Jo Milne-Rowe, chair of the IAI, said: “Each year, the awards highlight the commitment of our Institute members. The Institute relies on its members to keep supporting their branches and spreading the message about the benefits of being a part of the ironmongery community.